This school has, on average, 42% of pupils travelling actively each day. 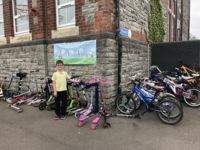 Their Small Step target is 54%, which is 227 pupils. The bike rack was busy today!